What’s wrong with being the party of “no”? Saying “no” is not easy. In fact, let’s make sure that government has the power to say “yes” in the first place. Is it constitutional? Can we afford it? Will it solve the problem? Do we even understand the proposed “solution”? Maybe Republicans need to change their strategy. Instead of being the party of “no” – why not embrace the party of “not yet”! “Not yet” – I don’t understand the bill, can you explain it? “Not yet” – I don’t think we can pay for it, let’s go through those numbers again. “Not yet” – why don’t we try this instead? More legislators should say “not yet.” Not all laws are necessary, and if it’s a good, well-written law, it shouldn’t be rushed. What do you think? Thanksgiving is a day that celebrates the good things in our lives – our family, our friends, our health, our home. I think it’s especially important to be thankful during tough times. Let’s take a few moments to think about Thanksgiving. It’s not about having the things we want – it’s appreciating the things we already have. Here are three Thanksgiving traditions that you can share with your families. After all, it just takes one year to start making new Thanksgiving traditions. * A surprise thank-you. Choose someone you know who works hard, but who doesn’t always get a lot of thanks. It could be your mail delivery person, a bus driver, or your favorite waiter or cashier, bank teller or librarian. On an ordinary day, surprise them with a drawing or card, cookies, or hand-picked flowers. Try not to spend more than $1; it’s about showing your appreciation, not the gift itself. * Thankful tree. Draw a tree trunk on a large piece of cardboard (from an appliance box) or poster board; or use a real indoor tree. Cut out shapes of leaves, flowers, nuts, or fruits; use tags or even ribbons. Everyone should write down at least one thing they are thankful for, and hang it on the tree. What are you thankful for? How can we be thankful year-round? According to Health Trends in Hawaii, there were over 361,000 emergency room visits in 2008. That’s over 900 emergency visits every day (though significantly fewer visits than the rest of the U.S.). Not only does it cost more for the individual and the health insurance company, it also adds a lot of stress for everyone involved. * Longer hours for health care clinics. Instead of opening from 8 am to 5 pm, why not offer extended hours – for example, until 10 pm. * The conversion of some clinics to 24-hour non-urgent health care clinics. Clinic staff could have regular office hours at night, a few times a week, to see people who work day shifts or who have medical issues that come up at the end of the day. By offering extended clinic hours, we could cut down on emergency room visits, save money, offer flexible working schedules for clinic staff, reduce waiting times to see a doctor, and even reduce traffic. Emergency room visits are expensive and stressful. The answer is not overhauling health insurance – it’s changing the way we handle “emergencies.” What do you think? The Legislative Branch costs Hawaii taxpayers $34 million each year, according to the Hawaii FY 2011 Executive Supplemental Budget, Budget in Brief (Multi-Year Financial Summary, page 3). That’s a lot of money for legislators whose main goal seems to be growing government. That’s a lot of money for laws that focus on spending our money, raising our taxes, and limiting our freedoms (to make us safer or healthier, of course). 1. Create a nonpartisan unicameral legislature. 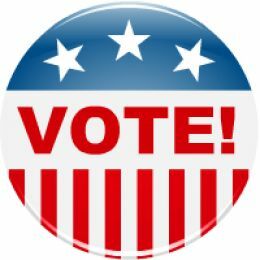 There would be a single nonpartisan primary election, with the top two candidates competing in the general election. Each senator would have a four-year term, with half the seats up for election every two years. We would have smaller legislative staffs and budgets, less duplication of proposed bills, and more time for actual debate. 2. Designate days (or weeks) in each legislative session to repealing existing laws, modifying outdated laws, and simplifying taxes. For example, there is a 66 cent tax each month on wireless phones to pay for enhanced 911 services. Surely, maintenance and planned upgrades doesn’t cost as much as building the entire system from scratch. The system is in place, so why haven’t legislators lowered or discontinued the surcharge? How are they spending the extra revenue? 3. Limit the number of new and amended laws proposed each year. This would require legislators to prioritize issues, reduce redundant and frivolous bills, cut down on paperwork, and allow more time for legislative and public review. For example, each legislator could introduce up to 5 new/amended laws and up to 10 co-sponsored laws in each legislative session. 4. Create bi-annual legislative sessions. Instead of meeting every year, the legislature could meet every two years. Five state legislatures – Montana, Nevada, North Dakota, Oregon, and Texas – already do this. Not only would this help reduce the number of new taxes and regulations, it would save money too! Here’s another idea: legislators could propose new or modified laws on even-numbered years, and propose the elimination or repeal of existing laws on odd-numbered years. How can anyone keep up with all of the new laws and regulations? Isn’t there a better way to balance our rights with government’s influence – and save taxpayer money too? Author, humanitarian, and founder of EarthSave International, John Robbins was inspired by Thoreau and took his ideals to heart. At age 21 he walked away from Baskin-Robbins, the company his father co-founded, and a life of wealth. For ten years, he and his wife Deo lived a minimal, subsistence life in a cabin on Salt Spring Island off the coast of British Columbia, Canada. In 2008, they lost most of the wealth they had accumulated to Bernard Madoff’s fraudulent investments. Now in his 60s, Robbins had to start over again. 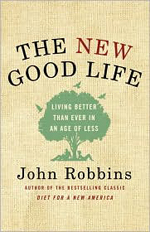 “The New Good Life: Living Better Than Ever in an Age of Less” (2010) is about doing more with less and achieving financial freedom. The central idea of the book is that “However much money you have or don’t have, your relationship to the money in your life can be transformational. It can be a doorway into greater consciousness, into greater integrity, and into greater freedom” (page xiv). To help us become aware of our spending habits, Robbins identifies the six basic money archetypes: the Saver, the Innocent, the Performer, the Sensualist, the Vigilant, and the Giver; and offers four steps to financial freedom: 1. Know your financial net worth; 2. Know your real hourly wage; 3. Know where your money is going; and 4. Know the value of your life. Most of the book is devoted to the five everyday, essential ways that we spend our money, and how we can do more with less – and live a happier life. * Reduce our housing costs: Choose a smaller, more intimate home; lower the costs and maintenance of home appliances; choose a neighborhood that is close to the places you need to go, with “walkability,” parks, and fresh water; consider renting. * Cut down on traffic: If you need a car, choose a used car or hybrid/electric car; look at alternatives like public transit, carpooling, car-sharing, biking, or walking. * Eat healthier: Buy fresh, local foods; buy in bulk; eat at home and make leftovers fun; cut down on fast food, alcohol, and soft drinks. Here are 12 power foods, inexpensive and nutritionally rich: popcorn, quinoa, flaxseeds, nutritional yeast, sweet potatoes, split peas, lentils, sunflower seeds, oats, cabbage, carrots, and tofu. * Make smart choices about kids: Consider a smaller family; teach children the importance of communication, helping others, and working together; start family rituals; help them to be skeptical about advertising and trends. * Keep our homes clean (without chemicals): Avoid expensive and harmful retail cleaning products; reduce clutter. Here are three inexpensive, nontoxic, effective, and safe household cleaning products: castile soap, distilled white vinegar (for non-stone floors and countertops, in dishwashers and clothes dryers), and baking soda (for sinks, tubs, toilets, and carpet cleaning). “The New Good Life” is optimistic, idealistic, and yet practical, with engaging anecdotes and personal experiences. We can all be happy with less. And we can start today. It’s Election Day, and I’d like to thank everyone who has already voted, and everyone who is going to vote today. Thank you for studying the candidates and thinking about the issues. Thank you for taking a stand and speaking out. For those of us who need some last-minute election help, go to the Hawaii Office of Elections website. For kids who can’t wait until they are old enough to vote, there’s the Kids Voting Hawaii website. You are currently browsing the Better Hawaii weblog archives for November 2010.